July 2018: There was a land slide along Sheba Ridge MR. It’s best to drop down and go around. Here are the coordinates of the slide: 048523 and 5650995 UTM. July 5, 2016: The Relay Ck Rd is in ‘normal’ condition. Drive-able with suitable 4WDHC vehicle to its end (Relay Ck Trail trailhead). May 17, 2015: The Hurley River FSR was recently graded from one end to the other. The pass is clear of snow and overall the road is quite good. Use caution due to loose gravel/dirt. UPDATE October 10, 2014: The road construction on the Hurley River FSR appears to be complete and the road is in good shape south of Railroad Pass. The surface is loose – drive with caution. Starting September 8, 2014, Hurley River FSR: expect two hour closures Monday-Friday, open for 10 minutes on the even hour. Recommend 4WD. Drive with caution, watch for equipment working. 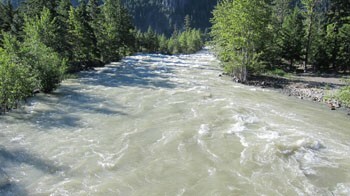 June 9, 2014: The Hurley River FSR is open! August 2013: Slim Creek FSR – road bridge near W end of road about 2 km before trailhead A has been replaced with a new road bridge and is open to traffic. 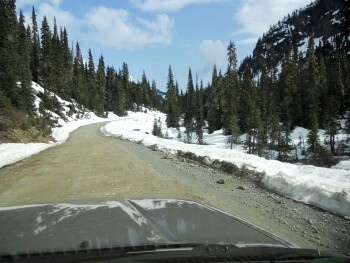 Summer 2012: Taylor Creek Road: The very upper end of this road is no longer driveable with vehicle (reduced to track). The road is brushed in and heavily rutted. Park near trailhead J and start from here. Quads can continue along overgrown Taylor Creek Road to trailhead K.
Summer 2011: Road 40 is now paved from Gold Bridge west to the junction of Gun Lake Road West & Lakeview Road. Summer 2010: Slim Creek FSR – bridge about 2 km before trailhead A is closed to vehicles. Park near bridge and start from here. August 2010: Mud Ck – Paradise Ck FSR bridges over Paradise Creek and Lindsey Creek: Both bridges on the Mud Creek -Paradise Creek FSR have been removed. There is no plan to re-install bridges at these sites. The crossings where these two road bridges were removed may be passable by horse, quad, bike or on foot – use caution. At high flow these crossings may not be possible. November 2009: The forest fires of 2009 did affect the South Chilcotin Mountains. Within the map area, some forest in the Tyaughton Lake area was burned as well as forest to the E of Tyaughton Creek. Trail access is now back to normal. July 1/2008: Mud Ck – Paradise Ck FSR & Mud Ck FSR – condition good. July 1/2008: Relay Ck Rd – road work by First Nations has greatly improved this road including the wash out area and the nearby steep sidehill section. Easily 4WDable to the roads end. As usually be careful driving this slippery road when it is wet – it is recommended to carry chains for such conditions. June 3/2007: Mud Ck-Taylor Ck FSR – some recent road construction just W of bridge over Tyaughton Creek has left a section of road in 2WDHC condition. June 3/2007: Mud Ck FSR – some rockfall has reduced condition to 2WDHC over a few sections. Sept. 23/2006: Relay Creek Road has been temporarily repaired. With next years spring thaw this road could be washed away again. July 2/2006: Relay Creek Road is washed out at ~km 17.2 (from the Mud Ck–Paradise Ck FSR junction with Relay Creek Road) which is approx 5km before the end of the road. This may not get fixed for some time. Nearest alternative trailhead is Paradise Creek Trail off Mud Ck-Paradise Ck FSR. For updates on trail conditions also check: bridgerivervalleytrails.ca. June 2015: The lower Tyaughton Creek Trail has significant blowdown between the trailhead at the Mud Creek-Paradise Creek FSR junction and the Castle Pass Trail/Route junction. Some progress has been made to date (June 15) to clear it out. June 2015: All creeks have very high flow. Crossings are dangerous and many are not possible at this time. June 2013: Paradise Creek Trail/Route – as the road access has not been possible since August 2010, this trail has likely seen little use since then. Be prepared for numerous windfall from the trailhead to the first crossing of Paradise Creek – most years the trail gets cleared in the fall by hunters but windfall may accumulate from winter to fall. Desite the greater distance involved, access via the Castle Pass Trail/Route (Tyaughton Creek drainage) may be a better option. August 1/ 2012: Taylor-Pearson Trail near Camel Pass on the Pearson Basin side – some mountain bikers are shortcutting between Camel Pass and the High Trail partially through the delicate meadows. Please stay on the trail. Do not shortcut! August 1/ 2012: High Trail – there has been recent logging near the start of the High Trail but the trail/road is still clear. July 1/2008: Little Paradise Ck Trail – conditions good. More horse traffic and maintenance then usual has made this trail easier to follow. Very little windfall. July 1/2008: Tyoax Pass Trail – trail thin and lightly beaten now but this should change once the trail sees more horse traffic this year. July 1/2008: Elbow Pass Trail – wet conditions with all of the melting snow but this should dry out later which about normal. June 3/2007: Lower Tyaughton Hiker’s Trail – trail cleared out and reflagged. Several windfall across trail – detours in place around most. Some short route sections. Sept. 23/2006: The E portion (approx 3 km of secondary trail) of Sheba Ridge Mountaineering Route (south branch) from it’s junction with the Open Heart Trail to where it turns to mountaineering route is in good shape. Trail is better beaten than last year as it has seen more horse traffic. Has been brushed out recently. The north branch of the Sheba Ridge Mountaineering Route has seen less use of late and so it has become less obvious in some parts. Sept. 23/2006: The bridge over Eldorado Creek along Gun Creek Trail has not been rebuilt yet but we have been told that construction will be started very soon. Sept/2006: A new Jewel Bridge has been built! This footbridge is located <100m W of where the old bridge stood. The old bridge has been removed. The new bridge sits on a concrete foundation and otherwise, is similar to the old bridge. Sept/2006: It was pointed out to Trail Ventures BC that the position of the side trail which branches off the Elbow Pass Trail (just W of Elbow Pass), and which climbs off to the S to become mountaineering route and which connects to Lorna Pass, is incorrect. This side trail and its junction with the Elbow Pass Trail should be shown about 250m further E (higher in elevation & closer to Elbow Pass). August 6/2006: North Cinnabar Trail/Route – This trail/route was recently cleared out from trailhead to alpine meadows (although a few large windfall remain). The trail crosses North Cinnabar Creek 3 times in close proximity – look for flagging here which indicates general direction of trail. In the large meadows of the upper basin, the trail/route is overgrown – make your own route through this area (as indicated on the map). July 7/2006: Lower Tyaughton Hiker’s Trail partially overgrown and difficult to follow. Trail Ventures BC plans to brush out and mark this trail by early summer 2007. See trip report by DougF. July 2/2006: Paradise Creek Trail condition is ok with more blowdown than last year. June 2006: Gun Creek Trail – footbridge across Eldorado Creek washed out. BC Parks is currently working on rebuilding this bridge. It is not too difficult to cross the creek here on foot in the meantime. To check on the status of the Hurley River FSR check www.for.gov.bc.ca. To check on the status of Hwy (Road) 40 check www.drivebc.ca.